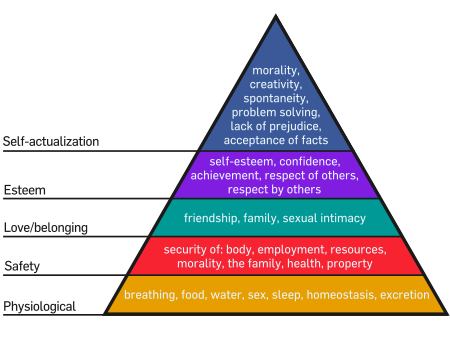 Psychologist, Abraham Maslow says that people work from the bottom up on this pyramid. When you work for money, you have covered the bottom two levels and are left searching for ways to reach the top levels outside of work. I’d argue that this formula for fulfillment is backwards. The relationship between passion and motivation increases over time. It becomes easier to stay motivated to work on your passion as time passes. Why is this? At first, your passion is enough to continue working even when you are not seeing high monetary rewards. You are doing it for the love and not for the money. The extra motivation starts to kick in over time because you begin to make money by doing something that you love. You have created a system that allows the money to be an added incentive, as opposed to the driving force. What I am essentially saying is that you should work backwards down Maslow’s Pyramid. You will naturally work harder to get down the pyramid in order to reach those essential bottom levels than you would to work up the pyramid. The bottom two levels are your greatest needs. Use that motivating factor to work even harder on something that you care about. Force yourself to include the top levels while pursuing the greatest needs in your life. 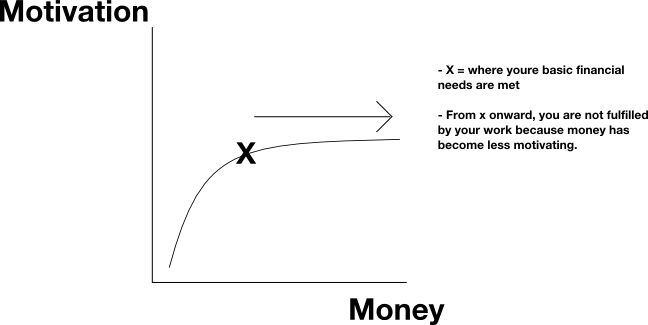 If you have the first two levels met (working for money), you will put less effort into reaching the higher levels. However, it’s those higher levels that represent a happy and fulfilling life. I think that we are too shortsighted when it comes to our careers. We look for what is going to meet the immediate needs and don’t consider the impact on our future. When we start from the bottom, we get stuck around level 3. We do not have a strong enough desire to continue up the levels but we also don’t feel satisfied with our lives. We continue on living in this safe area where we have the basics we need, but always feel like something is missing. 1) What are three things in your life that you would do, even if no one would pay you a dime to do them? 2) What do you spend time doing on Saturday afternoons when you have nothing else to do? 3) What did you LOVE to do as a kid? I really don’t think there are any magic tricks to this process. It takes a lot of self-reflection. Creating a career out of your passion often requires creativity. Creativity requires you to step away from what is common. Stepping away from what is common is usually scary; but doing what you’re afraid of is what will make you come alive. Think long term and work down Maslow’s Pyramid. A happy and fulfilled life is something available to everyone, if they change the way they pursue it.